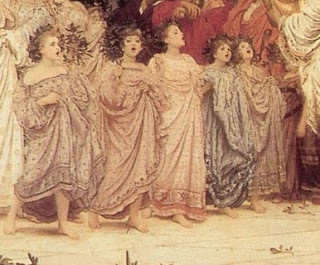 It struck me this morning that by writing about 24 women this month I'm doing the same level of work I did while writing Pre-Raphaelite Girl Gang. Mind you, with my book I was talking about women like Elizabeth Siddal and Fanny Cornforth, women who were very well known to me. The aim of this Blogvent is to talk about lesser-known women, women who don't get talked about as often. Women like Connie Gilchrist. I remember Judge James Pickles' ignorance of who the Beatles were being used to mock people in authority who were felt to lack any sort of relateable knowledge. What I didn't realise was that the original of this was Lord Chief Justice John Coleridge who asked the question 'who is Connie Gilchrist? ', a phrase used to undermine those who sit in judgement. It was a ridiculous question because at that time, Miss Constance Gilchrist was enormously famous. She was the rope-skipping Gaiety Girl, the artists model who was beaten by her mother, and the girl who married the Earl. Who could possibly not know who Connie Gilchrist is? Constance McDonald Gilchrist came into the world on 23rd January 1863. Her father was a Scottish mechanic called David, who had married Matilda in 1852. Matilda was an artists model and so it seem unsurprising that she would take her daughter with her when she went to pose. 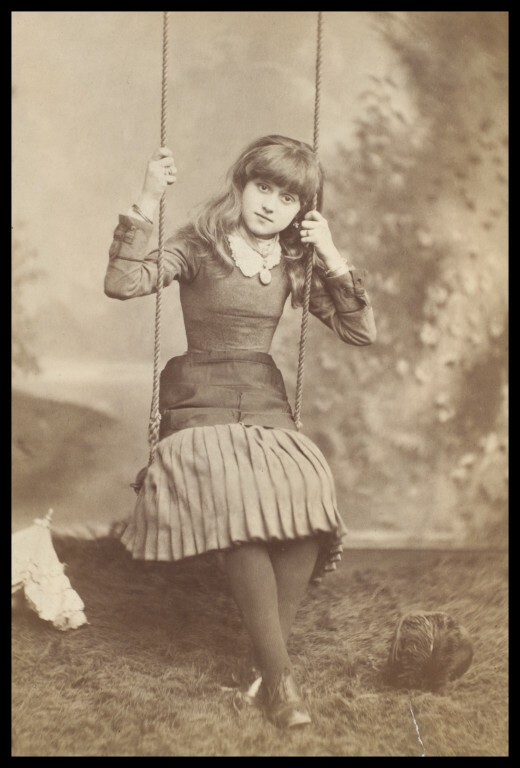 She posed for Frank Holl at 4 years old, and when she was 10, she was the model for his illustrations for W S Gilbert's 'Little Mim', which had a tight deadline resulting in long hours of work for the artist and model. After hours of posing she often had to be held up by Mr and Mrs Holl at the end of a sitting. Holl's daughter loved having another child to play with, especially one as fun-loving as Connie. However, Connie wasn't like other children because not only did her mother take her modelling, her parents had also placed her on the stage where she danced all the evening and half of the night. She was then taken home and washed ready for the next day's posing. 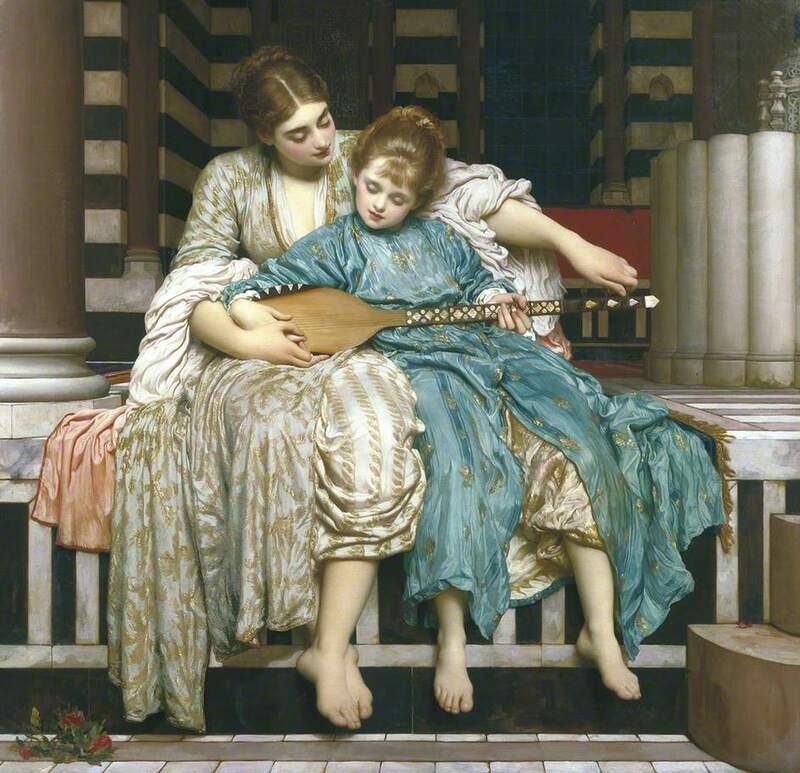 One morning, Connie had to be taken to an artist's studio in a dreadful state as her mother had whipped her for refusing to have her hair washed at 11 o'clock the night before. If we are to be more generous than Matilda Gilchrist deserved, it could be argued that her mother's intensity was learned from years in the modelling business, years that were definitely finite. 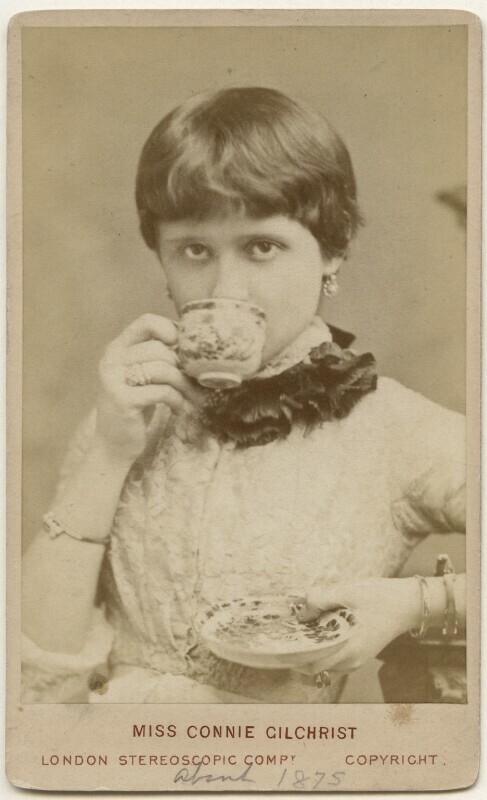 Matilda posed for Whistler and, as if to prove this theory right, he moved on to the daughter. 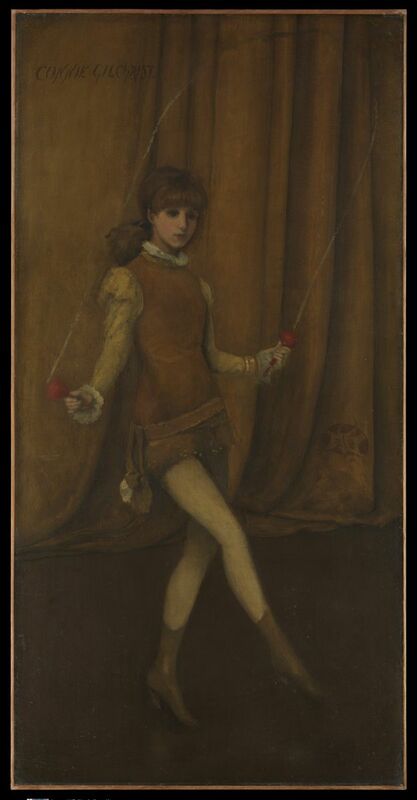 Connie Gilchrist was best known as the skipping-rope dancer at the Gaiety Theatre, immortalised by Whistler. She was described in this painting in The Morning Post of 1921 : 'The painting shows her in the act of skipping, with her fair, small-featured, babyish face, light wavy hair, and straight, slight boylike figure. She is wearing a short gold tunic, high fawn boots, and fawn stockings. The background is pale gold, against which glow the red handles of the skipping ropes, the only touches of bright colour in the portrait.' 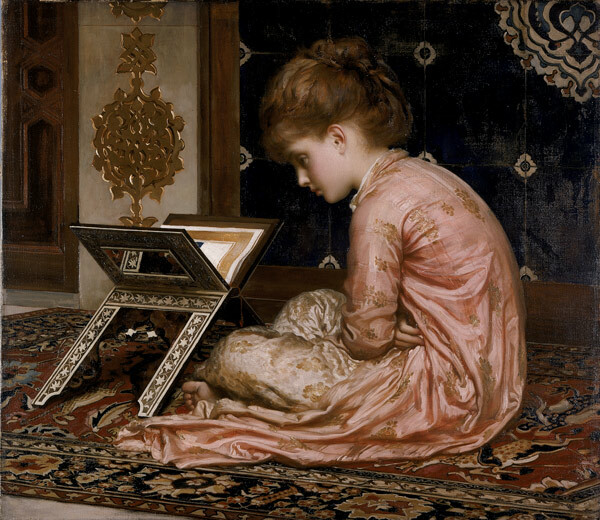 It was very popular, declared the painting of the year and sold to an American collection. Reading between the lines, the role of a 'dancer' in the theatre was not even as respectable (reputationally speaking) as that of actress, because there was not the great art of Shakespeare to defend yourself with. However, Connie's slenderness and child-like looks seem to have held back commentators on that score for a while. In fact, it was this very quality that drew another admirer to her. 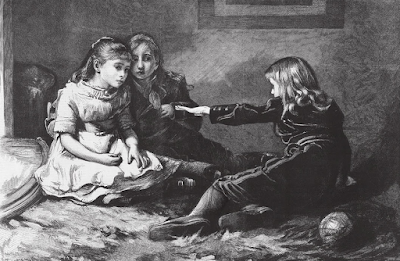 On a visit to the theatre, Lewis Carroll saw a play acted entirely by children - 'The harlequin was a little girl named Gilchrist, one of the most beautiful children, in face and figure, that I have ever seen. I must get an opportunity of photographing her.' 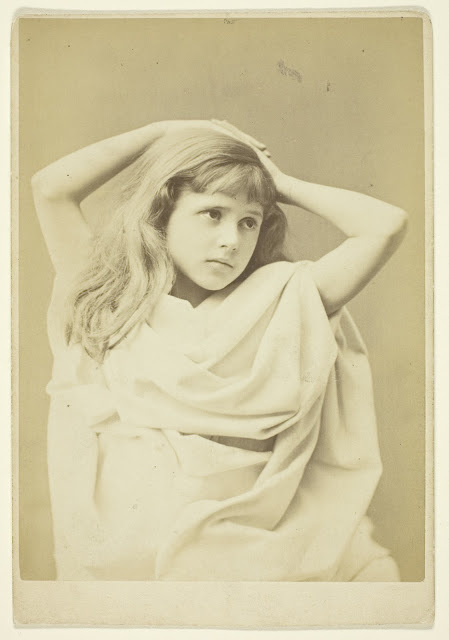 A month later, Carroll sent Matilda a letter offering to send Connie a copy of Alice's Adventures in Wonderland and wrote acrostic poems for her. When he finally got to meet her, he declared her the 'most gloriously beautiful child' - 'One would like to do a 100 photographs of her', although it remains doubtful if he ever even managed one. In July of the same year, still mad about the girl, Lewis Carroll stopped by the Westminster Aquarium to see Connie do her act and then take her to the Royal Academy to see some paintings (possibly even some she appeared in). The relationship cooled and Carroll moved his affections to other children and when he saw Connie doing her skipping rope dance again the following autumn, he recorded in his diary that she was losing her beauty. She was 13 years old. Not everyone was a fan of little Connie. 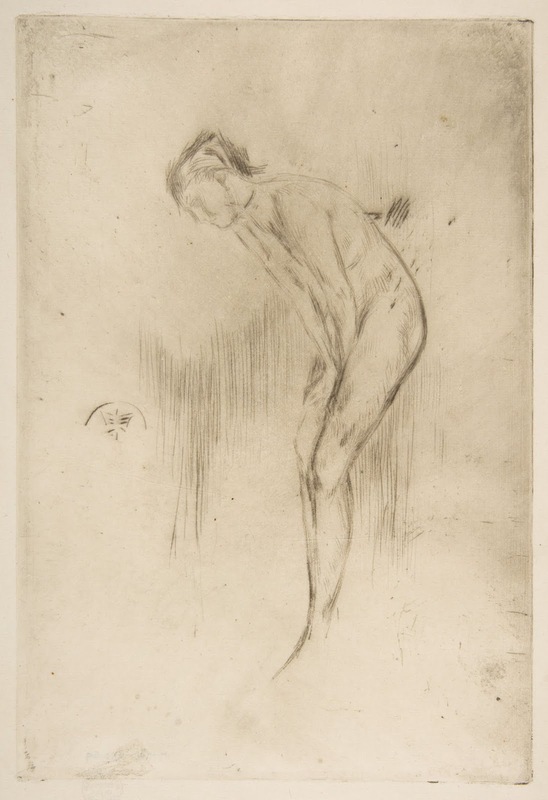 The London Express of 1879 wrote 'Miss Connie Gilchrist's education being probably as limited as her apparel, she would doubtless need to be told that the 'Gold Girl' [the informal title of Whistler's painting] is a libel on her personal appearance.' One other charming soul remarked that if any 'patient at Worcester' behaved and dressed like Connie did on stage, they would be put in a cage for life. The comments seem to be more about Whistler and his choice of a scantily clad child as subject, but it is Connie who named and shamed at 14 years old. 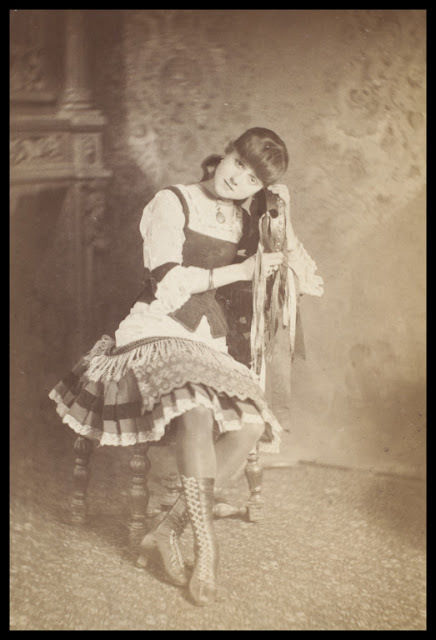 Connie Gilchrist performed in popular pantomimes at the Adelphi Theatre and Myers' Circus Company in Paris, and even did some straight acting, at which she was not in the same league as Ellen Terry but pleased her audiences. 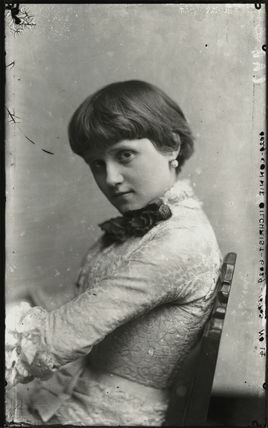 She played Maid Marion in Litle Robin Hood (1882), and Anne in Blue Beard (1883). She still posed for Leighton, seemingly never aging, but if her life was as hectic and hard-working as it seems, it's hardly surprising she remained such a wisp. Had this been the amount of Constance Gilchrist's life, I'd be quite sad for her. Yes, she was well-known and much in demand, however at what price? If you are whipping your child in order for her to fulfil your dreams of stardom then you missed a parenting meeting. However, her stardom brought a rather prestigious admirer to her door. In the newspapers of 1892, rumours abounded about whether Miss Connie Gilchrist was about to be led to the alter by none other than the Earl of Orkney. Edward Walter Fitzmaurice was a year younger than the actress, but the couple found much in common including Miss Gilchrist's apparent love of hunting, shooting and fishing leading one newspaper to declare her 'a Diana among hunters'. The Earl was young and not very well known in society. He had lost both parents and elder brother in the decade before, and so, at the age of 25, found himself an Earl and in need of a wife (as Jane Austen would say). The couple were married in the summer of 1892 in front of a small group of friends and family. By this point, both of Connie's parents had died and so she was given away by the Duke of Beaufort. After a quiet Wedding Breakfast, the couple left to honeymoon in Minehead. I went on holiday there once, I caught crabs. The trick is to use bacon.